Good morning sweet friends. I’m wishing you a Happy April Fools Day, but my hope for you today is that you’re nobody’s fool. :-) I also hope some of my regional friends are out of harms way with the crazy weather we’ve had lately. I’m sure you wonder how I come up with the Friday question; so often it’s something that has happened in my life or been talked about this week.
. . . my brother became a grandfather with the first grandchild in our family! As I talked to my children and friends we mused how things have changed over the generations. I was a pretty strict mom and lo and behold, my kids (who are in their late twenties) have all come back to say thanks for sticking to my guns even though at the time I was not very popular. I’m tickled as I watch my kids save money and make homes to hopefully one day welcome children – I feel like they’re planning for the long haul. The most comical thing that’s the essence of being a parent, is when I hear my words come out of their mouths!! For my card today – this my simple classic card that’s a go-to on so many occasions. 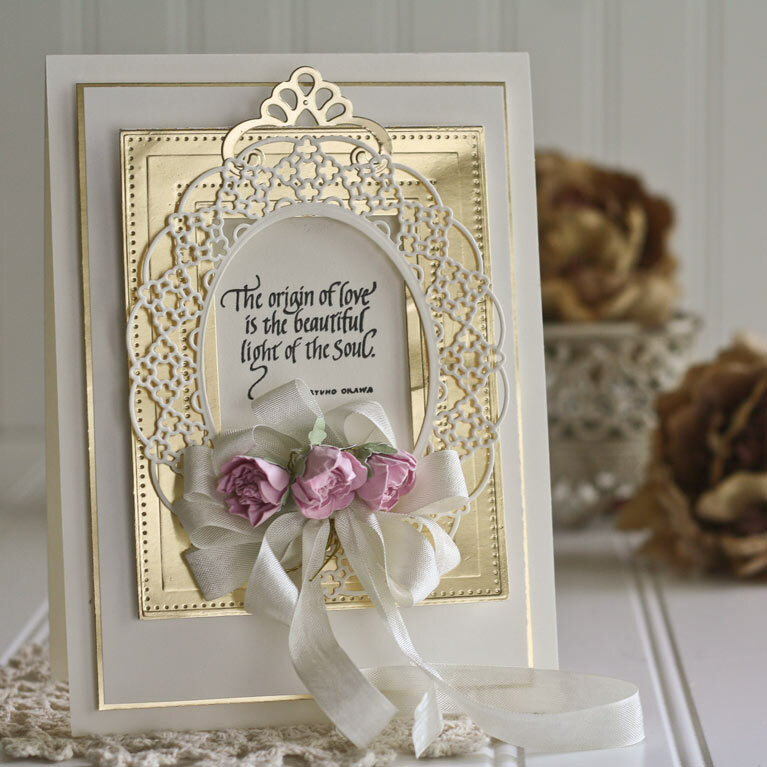 It’s simply cream and gold layered with Spellbinders Pierced Rectangles. On top of that I layered Spellbinders Oval Regalia. In the crook of the oval I placed three Spellbinders Cinch and Go Flowers (easy to place because they are built on wire and wrapped together – tutorial HERE). 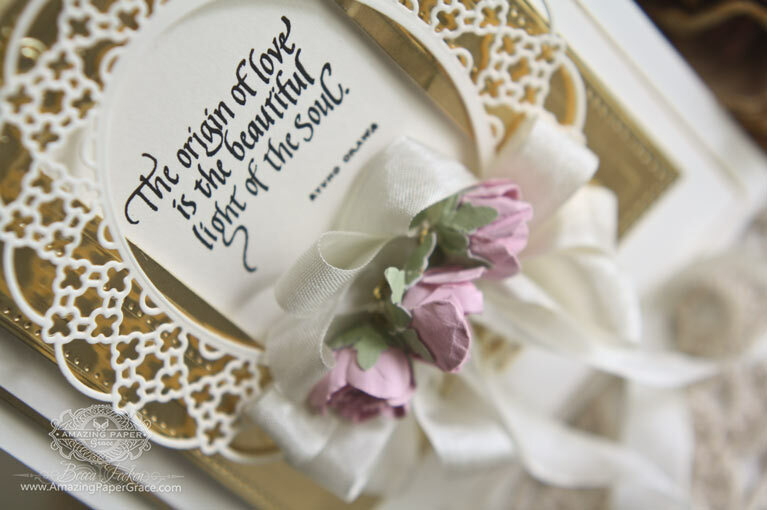 Digging through my sentiment stash, I found a sentiment by Quietfire Design – The Origin of Love – I don’t think I’ve every used this before and it simply tickled my heart. This card is up for grabs today to one of my sweet readers. Every Friday, I give away a card to a randomly picked reader who leaves a comment in our conversation. Want to know more about Day of Giving, here’s a link to my FAQ’s just check out #11. For your comment today – Give me a one liner – As parents, our duty to our children is …. As a parent, and grandparent, I felt my duty was to raise children with positive self esteem, to teach them to be independent and self sufficient, to take responsibility for their choices, have respect not only to others but for themselves, to have hope and faith and joy, to have laughter and fun and to appreciate the wonders of life and nature, the importance family and giving is so much more rewarding than receiving, and most importantly to give them unconditional love. What a beautiful card today. All Fool’s Day was the day my parents got married!!! My duty to my child is to show her God’s love, encourage her, and give her the tools to live life to the full. STUNNING CARD BECCA!!!! You say simple and classic, I say STUNNING – will grab anyone’s heart! As parents, our duty to our children is to bring them up by being an example of what is right according to God’s Word. Hi Becca, what an amazing card here again. I just love the white and gold, and I love the sentiment too. Yet another beautiful card, i so love the sentiment also. ” if you can not say anything nice , then do not say anything at all ” . Yeah I actually made it on a Friday lol! Stunning creation my dear, just beautiful. As parents, our duty to our children is to teach them right from wrong and to show them LOVE. 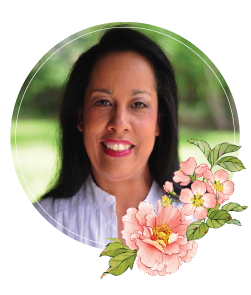 As parents, our duty to our children is … to help them grow into self sufficient caring adults. I had to laugh when you mentioned your words coming out of their mouths. when my oldest was first home from college he gave his younger brother the best lecture on how good he has it. I couldn’t have said it better myself and I didn’t have to say a word. it was classic. Beautiful card. I especially like the crown on top of the frame. I call myself a childless mother because of my strong maternal feelings. My children, however, wear fur pajamas. As parents, our duty to our children is to love – love them, love ourselves and love each other with God as our center and our guide. In all relationships, love is always the answer. A beautiful elegant card Becca with a lovely sentiment. – To teach them to live their lives – not to live it for them. – To be their best parent, not their best friend. Love your stunning card. – Respect – to the Church and to everyone and everything. What a fabulous card!! Just gorgeous. As parents, our duty to our children is to love them unconditionally! Our duty to our children is to give them unconditional love. Your card is gorgeous, Becca! And a one liner – to raise them as God would have us raise them. Our duty as parents is to love & teach our children to love others as God loves us & commanded. Best and only duty as a parent – love them, love them, love them, to the very best of our ability, and recognize that some days are better than others at that! From that love grow all the other things they need – responsibility, work, sense of self, worth of others, love of God however they see him/her, justice, purpose, kindness, mission…all of it. Okay…my mind immediately went to a non serious response to today’s question. I hope that’s ok. My duty to my children was to prove I really did have eyes in the back of my head! Hee hee! Seriously, I tried to reach my children to be honest, love God and others at all times. Becca, your card is simply STUNNING. So gorgeous! Hi Becca, a gorgeous card as always. Our duty to our children is be respectful and treat others as you would like to treated. I think we have done well with our 5 children (the oldest 51 and the youngest 44) they are all wonderful adults as is our 9 grandchildren and we have 3 great grandchildren who are young but nice children. What a lovely card, Becca! It is our duty as parents to prepare our child for adulthood at any means necessary! Pretty simple. Good morning Becca, simply stunning!!! Being a parent is so many things. Wish it could be put into a one liner!!!! Gorgeous Card. My duty as a parent and as a grandparent is to instill good morals, love and respect of God, family and others, and to teach them good common sense practices while always insuring that they never doubted that they were and are loved. In short – a good solid foundation on which they can use to build and mold their own lives. As parents our duty to our children is to teach them to love and fear God, and to treat others with dignity, and not to judge. to be their parent first and foremost. Our children have also said thank you. It’s not easy being a good parent. God didn’t design us to be friends with them first. That comes later and it’s a wonderful feeling. Beautiful gold and white card, Becca! Love that die! Our greatest job as parents is to unconditional love and to teach our kids “R-E-S-P-E-C-T” for others!! Hi Becca, This is a truly beautiful card, with a truly beautiful sentiment. I had to chuckle at your post “The most comical thing that’s the essence of being a parent, is when I hear my words come out of their mouths! !” – I know exactly what you mean. I find that I say things that my Mum used to say to me, and in turn, I find that my Daughter says the same things to her children. It proves that we all listen haha, and I find it really endearing. I have always tried to show my children the best ‘paths’ to take and to hopefully give them a solid foundation, and to always show respect to others, and to let them know that, no matter what, I will always be there for them. Beautiful card. As parents, our duty to our children is to be present, caring, nurturing, guiding, and engaged while we discern what they need. At the same time we have to keep growing ourselves so we always have more to give. As parents our duty to our children is to: Train them up in the way they should go. Hello Becca lovely card love the regalia die ! Congratulations on being a great Aunt how good is that .